Throughout this project I have learnt a lot about not only myself but with working with others. Having done the activity previously of being put into external and internal groups really benefited me while working on this project. 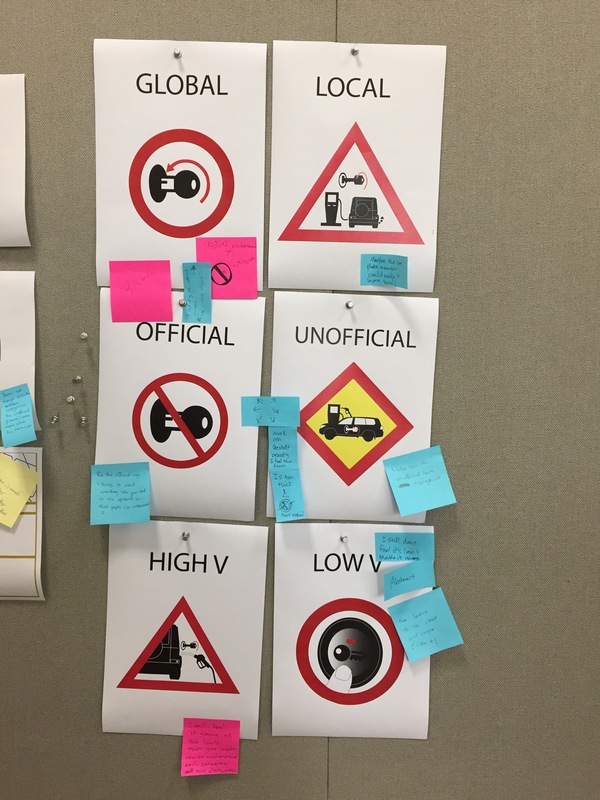 It made it much easier to communicate with my group members as I felt that we were all on the same level and wanted portray the exact message in our pictures. Although the process took a while it was interesting to see the final result as it was not what we expected, personally I feel that by taking these photographs I not only developed my skills but understood and appreciated the beauty of the visuals as well. During the process of taking the sky photographs I learned a lot about how timing can play an important role in how the sky would look, this is what made our final outcome most interesting. 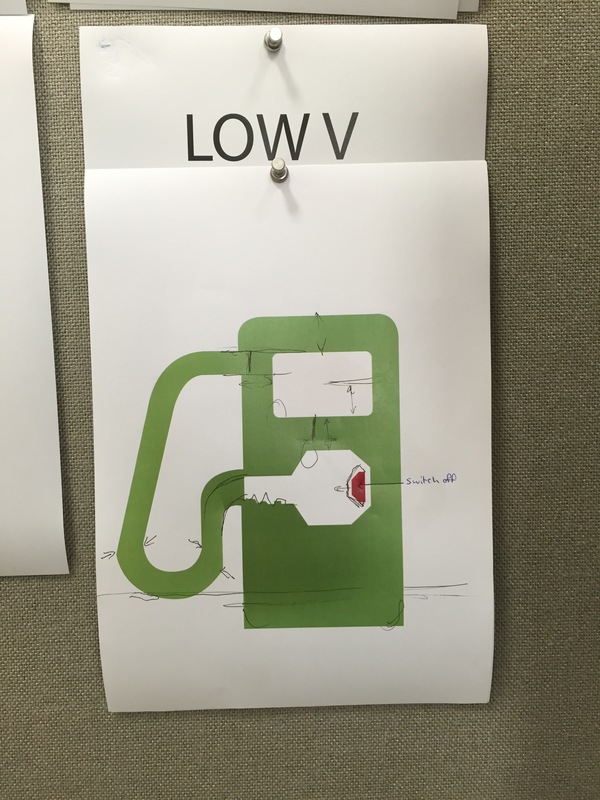 The most difficult aspect of this project I have faced was probably in the beginning as I was confused and lacked the knowledge of how we were supposed to accomplish this visual representation. Working with my group and communicating really helped me understand the project more as they were very supportive. I never liked working in groups as I thought I was not good at it but after this project I learned a lot about myself, I learned that sometimes working in groups can actually help me in developing a project more sufficiently and working in groups will also help me in the future as I will be put with different people and I need the skills in order to work well with them. Overall, this project was very enjoyable, I learned a lot about visual deconstruction /joinery. Since all of our images are very high resolution, the file size was HUGE! Every time they wanted to print it would take about 7 minutes and the printer would cancel the order because their printer can’t handle such a huge file.. Thank god that we were done with our poster 2 days before the deadline that gives us the chance to handle any issues that we might face. So we took our file and we went to Xerox with our hope high that we will print the poster by today and we will be the first to hang, since all of our classmates are struggling and still working on it. 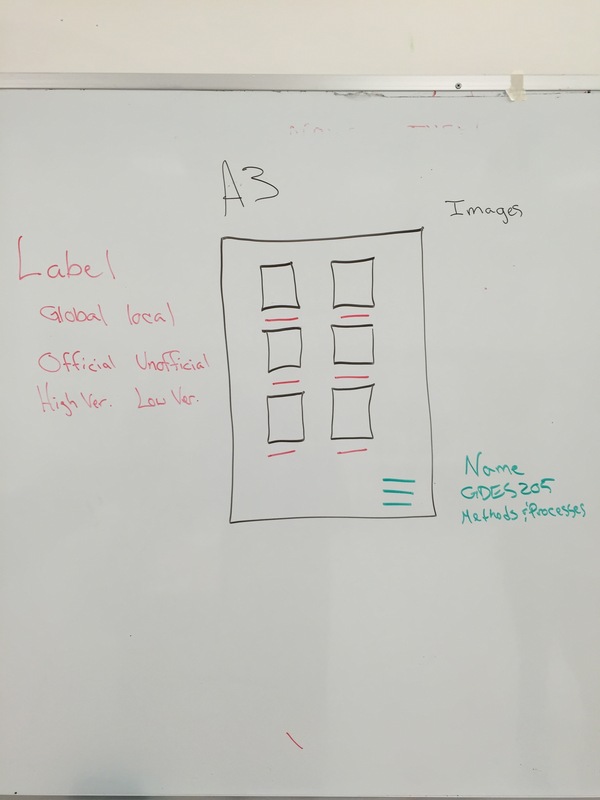 And the same sad story happened again… our file was so big that he couldn’t print it, so we sit altogether thinking and discussing about how are we going to fix this issue. Since we printed our imaging poster using the printer in GDES printing room, we decided to try to print there by our self because we already know how to print and how to use that printer. Working with the group we distributed the work into sections. When looking at the concept of color matching we wanted to portray a visual image showing different shades of the same scene. The process was done in stages as well, for example the sky was taken throughout 3 different days during day light at distinct times i.e during sunset, the afternoon, and when it was cloudy. This wasn’t done intentionally but we were rather happy with the effect as it gave more depth to our image portraying different times of the day where we normally would be standing outside. After we photographed the roof and searched for inspirations, we divided our work equally so that each one of us will work with the same thing and will have the same amount of work. We wanted to create something different from the others, and we focused on how to make this poster interesting. We all agreed that the organized work is somehow boring, so we decided to do it differently and to play with images and trying to create a scene that is somehow like illusions more than sticking the images next to each other to get the right view. 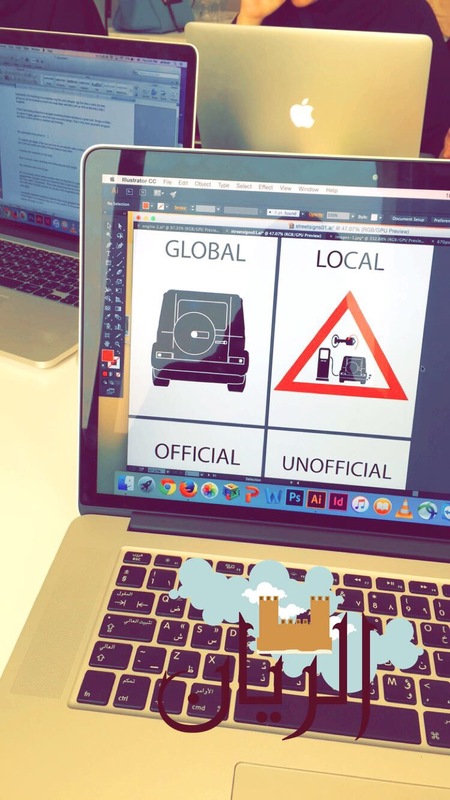 Since we have our images printed, we started to connect them, play with them and experimenting before starting the actual final poster. We all believe that the more we experiment with different placements, the better. And it was amazing because when we did the middle part, the ground, we actually liked it a lot and we decided to do the same thing with our final outcome. Before we worked, we did some research and we looked up for some inspirations. 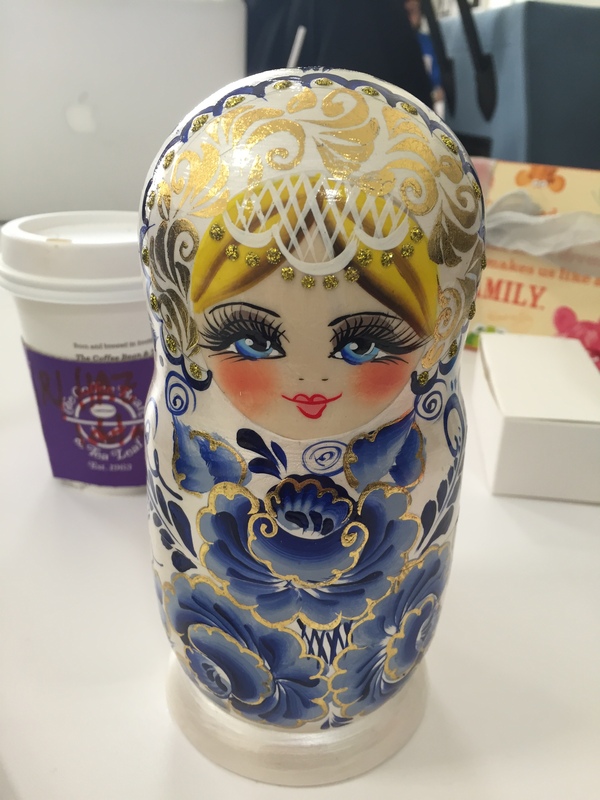 We wanted to collect ideas and then developing what we liked so that we can own the new idea. In the second day of that project, we were having an inside trip in order to look for a specific location and start separating the location into parts in order to give each group. we didn’t knew the place, and to be honest? it’s more useful not knowing the place in order not to map and start over thinking about it. so we went to a specific place, which is the ceremony in education city. the place were divided for each group, in the very first photos the security came in and start saying that it’s not allowed… so we left the place going to another, we went to vcuq’s roof. The place is wide, we were actually happy and satisfied for our side since it’s more nature than the other groups, they were more into electric/ machines and wires. our place is more about sky, buildings and instructions… we thought of choosing a specific place in order to focus on, and take many photos of it… to give the sense (sound and how it feels) in the final poster. the view wasn’t 360 degree but only our right and left/up/front side. We bought 3 cameras for each person with the same lens (fish eye)… because after that we want to complete each other. After taking lots and lots of pictures we had a meeting where we can share ideas and look for each others picture. and off-course we can;t just imagine unless we experiment because in order to become a designer you have to experiment as much and as diverse as you can.. in order to be satisfied with the final outcome. Works well in a team with visionary thinkers. Working all aspects of problems. Wait for clarity to emerge. Listen to the building of the ideas. Do not like to be put on the spot unprepared. Send them the agenda early. The way in how our both profs start giving us examples in external and internal people.. some from our classmates. 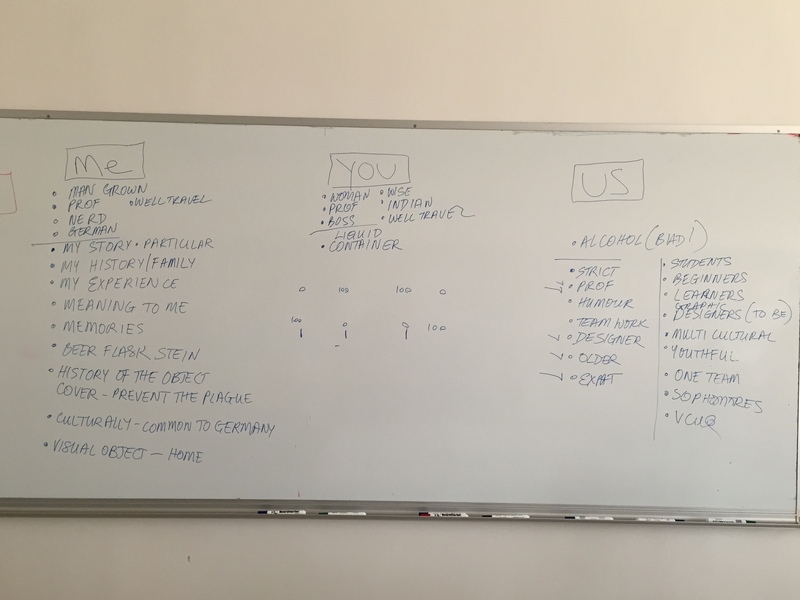 we start dividing people.. and by this exercise the profs created a chart of different categories so each person go there and stick a sticker in where we think we are. after that, we left the class and left our both profs for arranging the group work.. our group is consisted of 3. 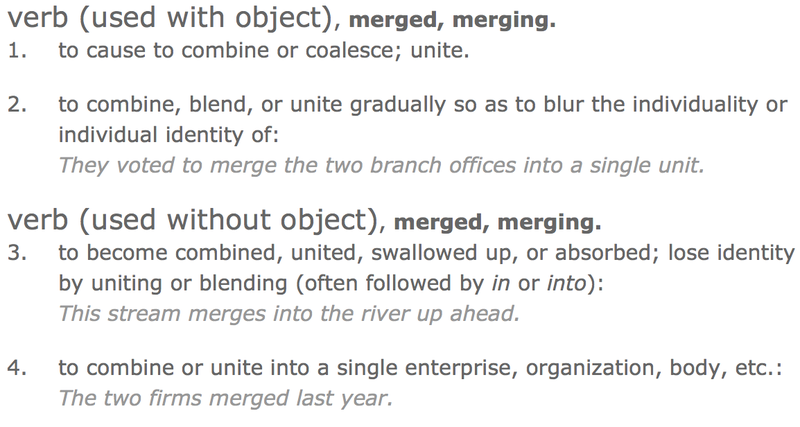 MERGING: Merging is the first step of the search process where we bring diverse ideas, objects and thoughts into concert. SEARCH: Pursuit, examine. 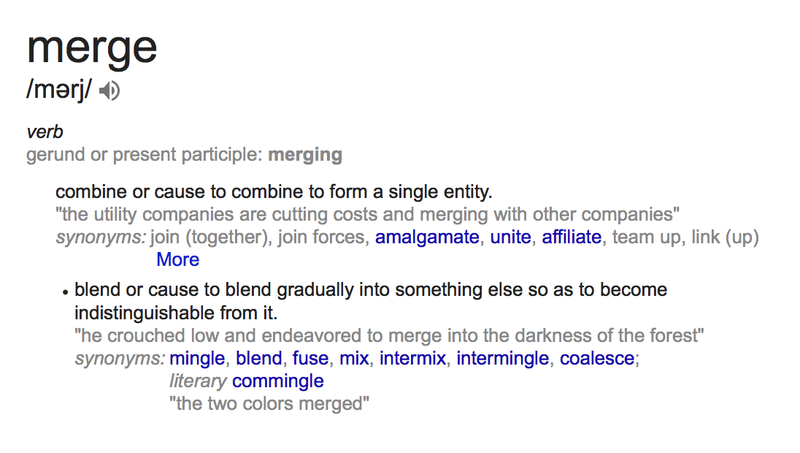 A divergent process with an idea to broaden your knowledge. 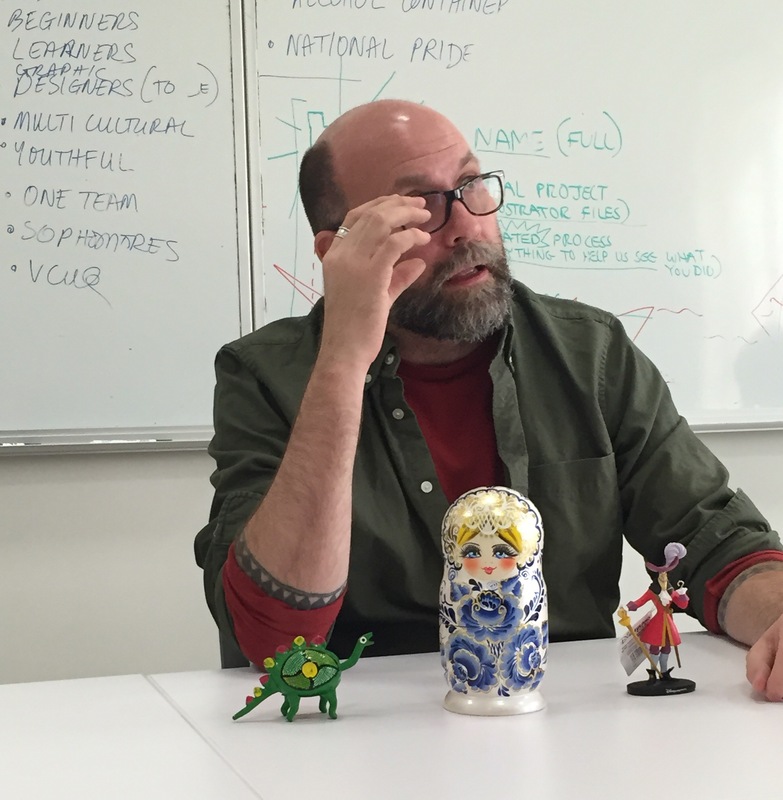 RESEARCH: an investigative process, Precedence studies. EXTRACTION: Examining the potential impact and meaning of the chosen avenue of exploration. Icon: An icon resembles the thing it represents, such as a pictorial representation, a photograph, an architect’s model of a building are all icons , because they imitate or copy aspects of their subject. Index: An index has a factual or causal connection that points toward its object e.g. Green crescent sign. Symbol: Has an arbitrary relationship between the signifier and the thing signified. (Direct link between the sign and the object) e.g. Smoke for fire, foot prints for person. This was the process of my thinking as I tried to decide what sign to design. Signs that are important and those that are not. 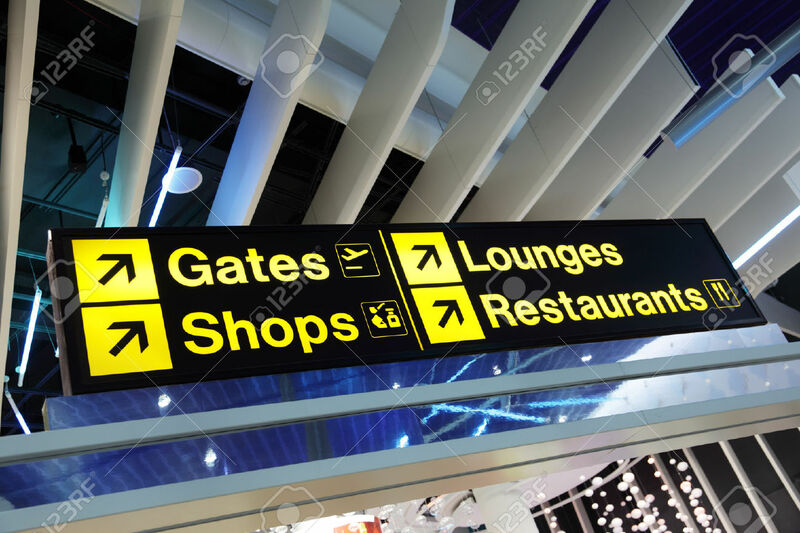 Example: arrow to indicate emergency exit and arrow to indicate direction of lounge in airport. Signs we ignore and signs we obey. 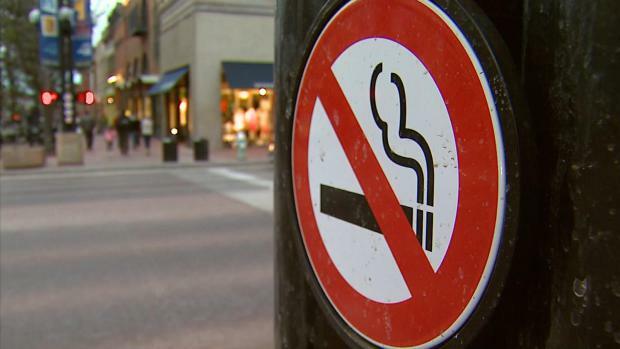 Example: No smoking signs in cafes in Malls in Qatar and No Entry signs on streets. Signs that are important, but that we ignore. 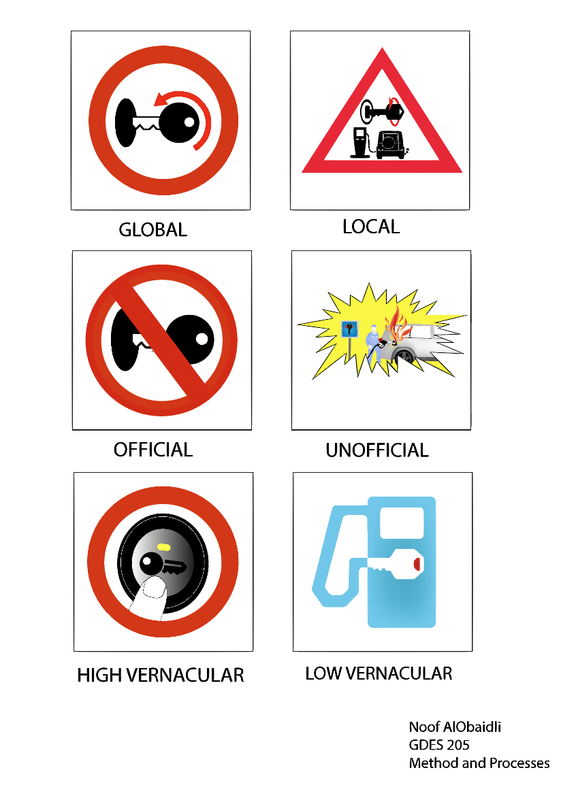 Signs that are important because they indicate danger, but we ignore or we don’t see them. The problem seeking: its not known, some people don’t switch off their car while other have no idea how dangerous it is specially that we live in a hot country. Also you hardly find such sign in a petrol station, its either hidden somewhere behind or not there at all. 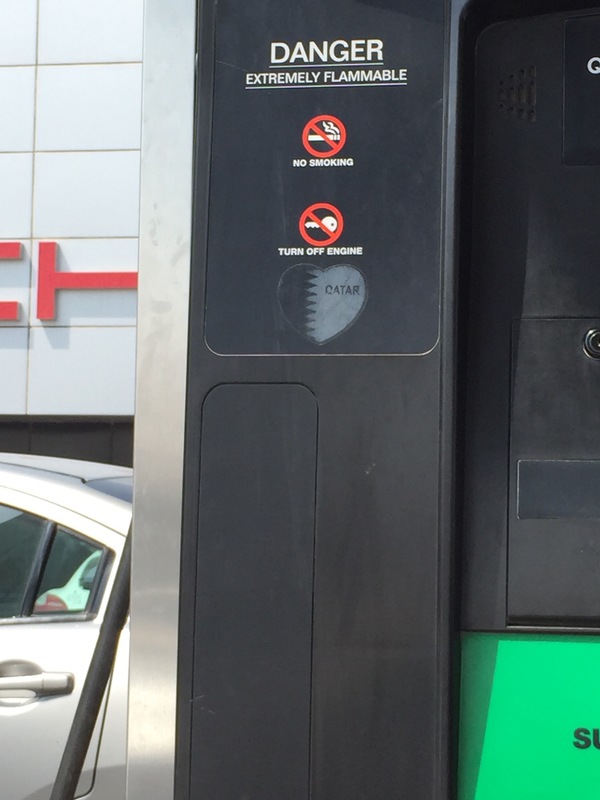 Petrol station signs about switching off engine while filling with petrol. 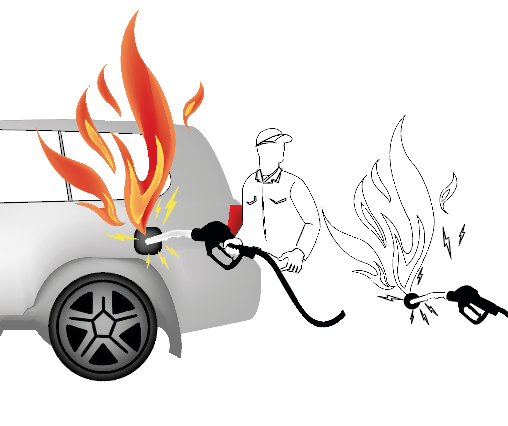 In a hot country like Qatar, there is a high risk that an engine could create a spark and cause an explosion while the car is filling with petrol. However, most people do not know this. The petrol companies know about this and there are signs that tell people to switch off their engines when they are filling with petrol. 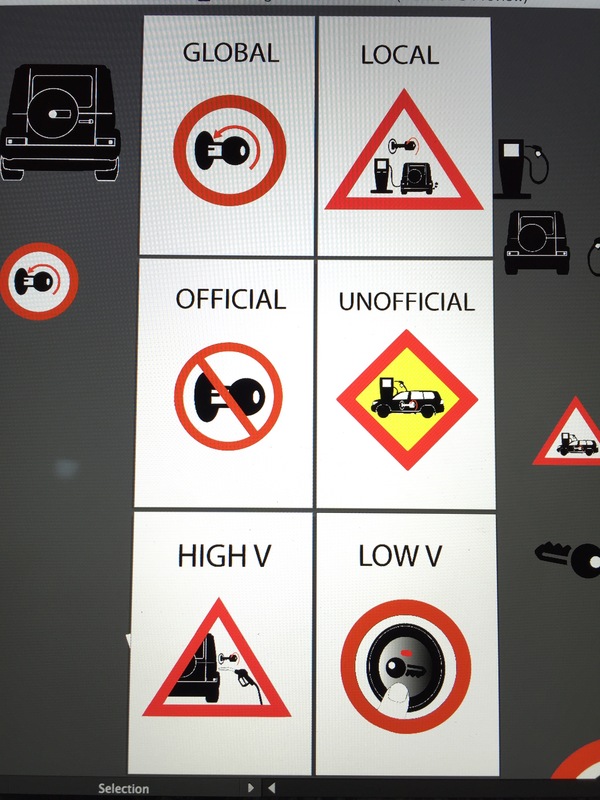 The problem is that these signs are small and they are not very obvious to drivers, so people do not usually switch off their engines when they are filling with petrol. Make very large signs that everyone can understand because Qatar population is from many nationalities, so a sign is more useful than a sign with text. 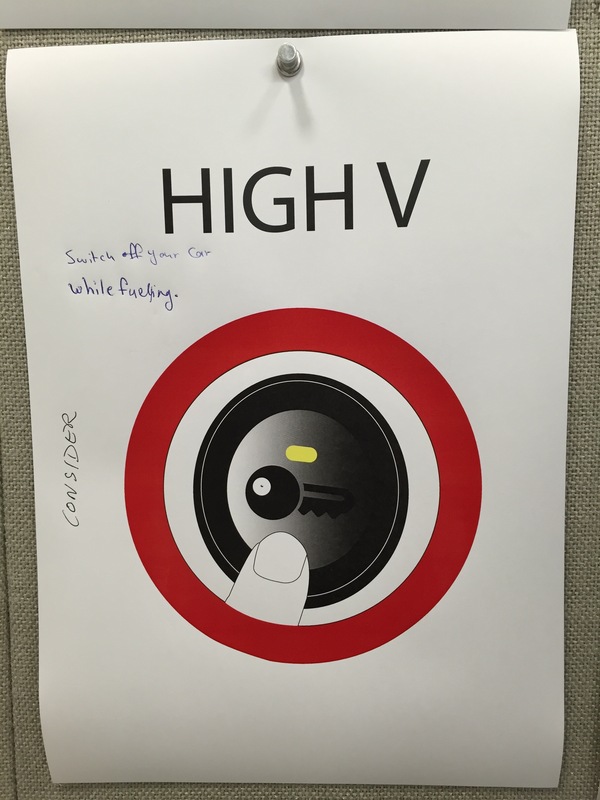 If the sign is big, drivers will see it and they may switch off their engine. At the same time, the sign needs to be clear and does not depend on where a person comes from. 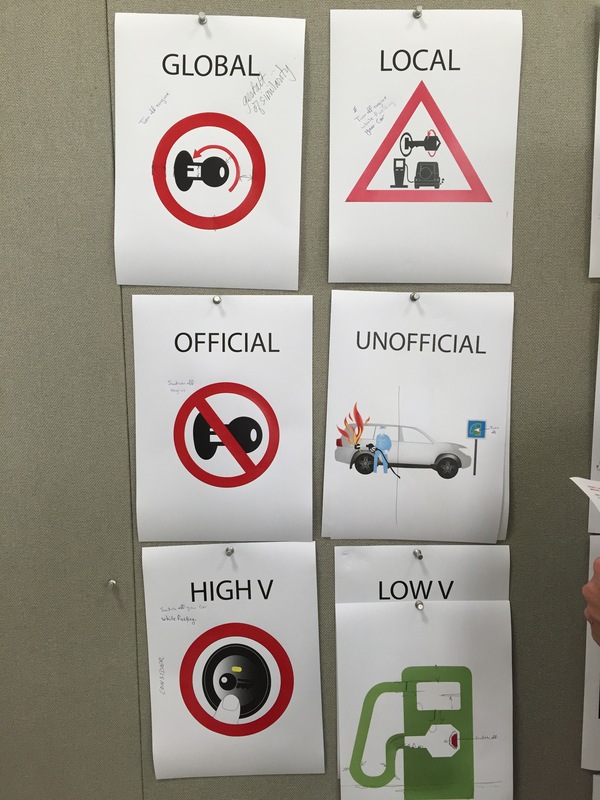 This means that it is better to make signs that are linked with local driving, that are high visibility, and that are not so formal (high visibility). 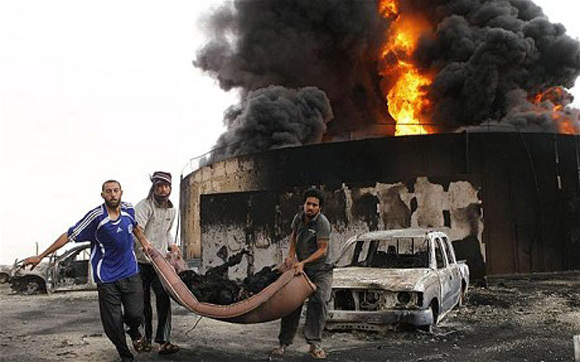 Aware that it’s a must to switch off their cars off once a car is getting filled with petrol. 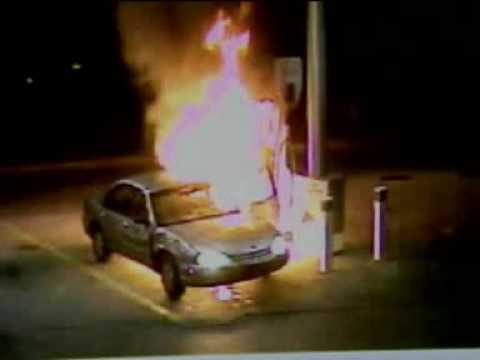 Our goal is that people will be aware the next time they visit a petrol station. Meaning for any language speaker and for people who cannot read. Global: understood worldwide without indicating a specific culture. 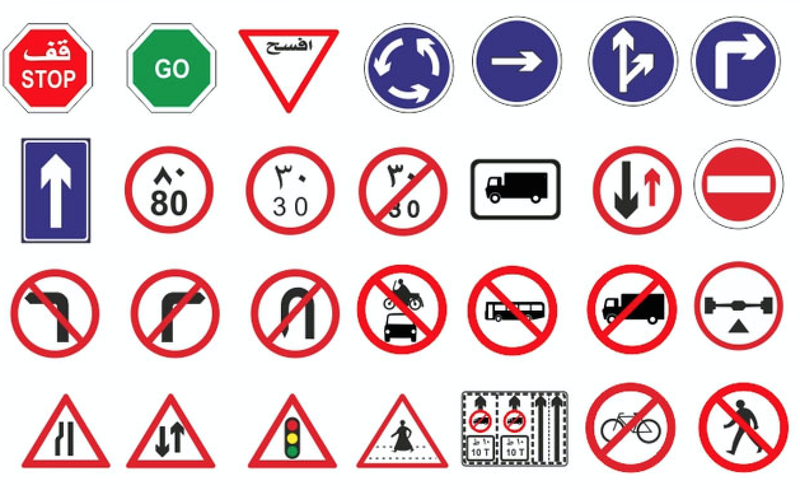 Official: government signs that are shown in the public roads, clear distinction without additional context. 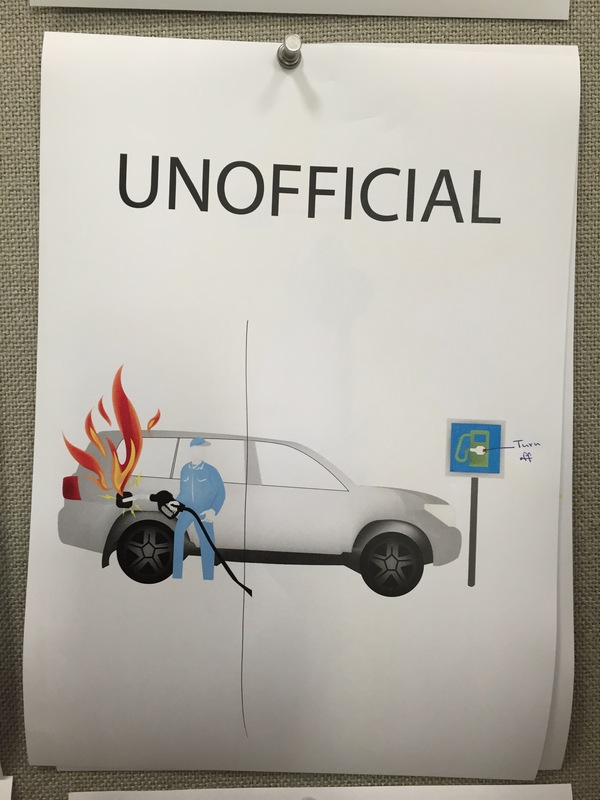 Unofficial: humorous, silly, funny, adding a twist to the official sign. Low Vernacular: a more exaggerated sign of the unofficial signs, graffiti signs, rapidly designed, a hacked sign in a bad neighborhood. 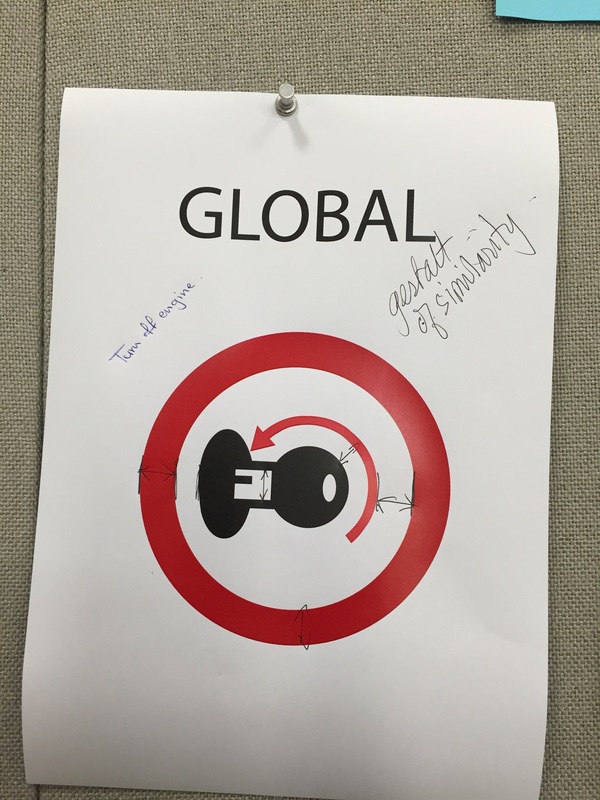 the global sign for switch off is to turn to the left. The key is the thing that they have to turn. The local sign should have more impact to locals if it looks local. Changing the brand 4 x 4 as the car. This car is very typical of Qatar. 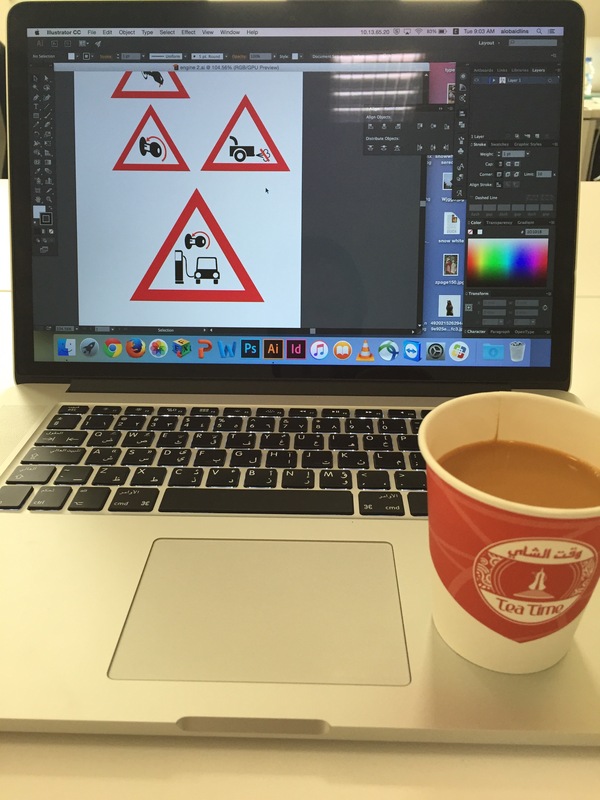 I thought of the road sign of a person crossing which shows a man wearing a Thobe and that inspired me to use a very typical local car. Signs with a line through them have the standard meaning of something that is not allowed. 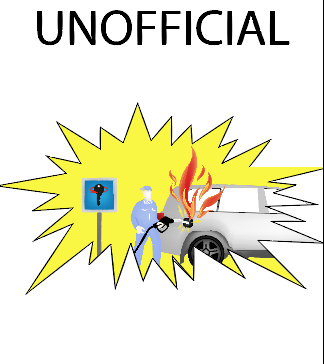 That is what I wanted to show in the official sign. I wanted to make the unofficial sign like something that warns of danger in a very strong way. I thought that red color is a good way to do this, especially if I contrast red with another color. I wanted a sign to attract attention, and to be clear what message it was sending to the audience. I know that if a sign is confusing, people will ignore it. After critiquing my work, I gathered the comments and I found it so helpful. It helped me to see people’s view and how I can improve my designs. 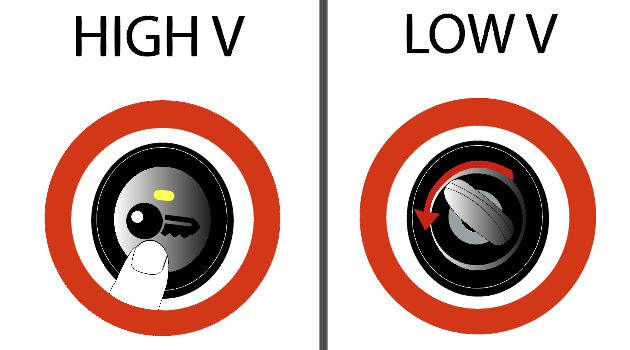 The High V. and Low V. are similar to each other. 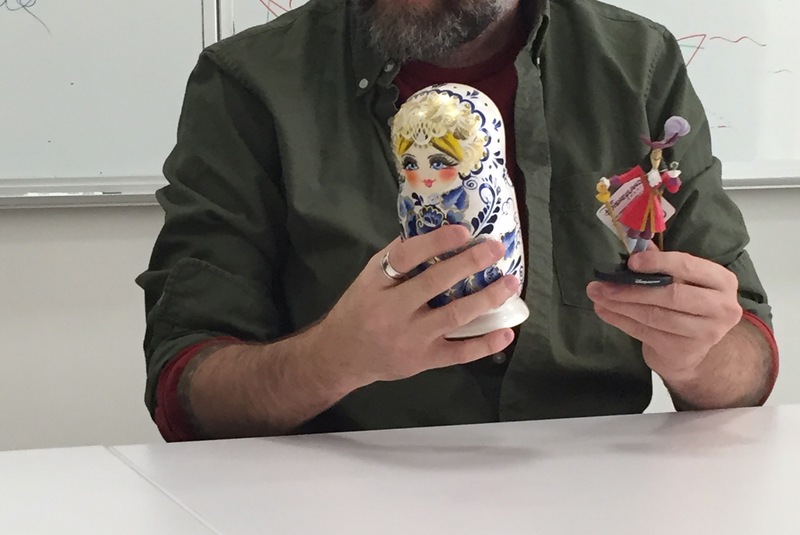 I got a really good feedback after critiquing my final design, it was so clear as the audience said, and I just have to fix my craft on illustrator and make it more accurate. 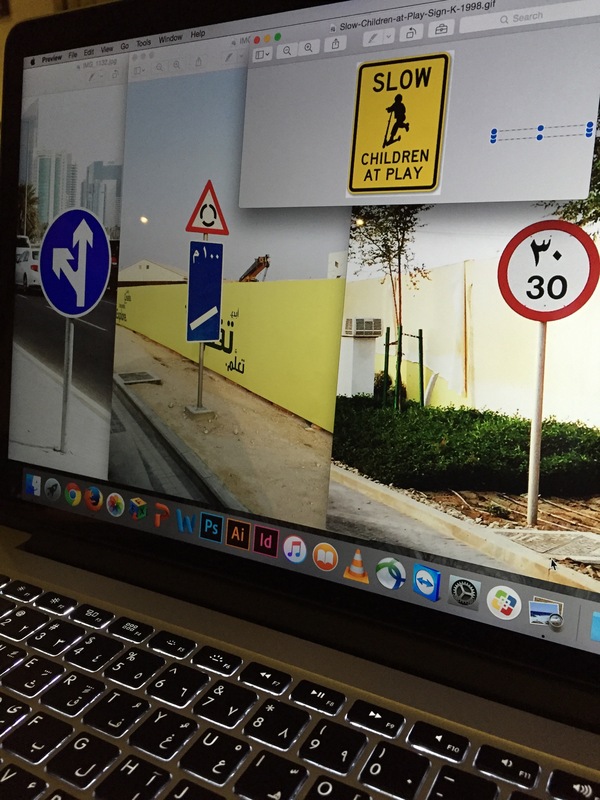 • For the local sign, I wanted it to be understood by all people, including the many workers who live in Qatar, but who do not read or write Arabic or English. 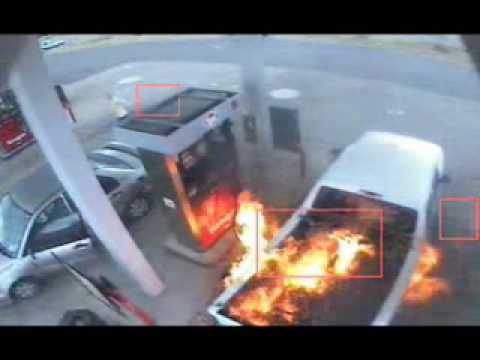 This is why the sign is very explicit and shows exactly what they should do when they are filling their vehicles with petrol. This sign is also inside a red triangle, which is also used on the road to warn of danger with a sharp edges. • The official sign is a standard line through a circle, as this is the normal way to show that something is forbidden. 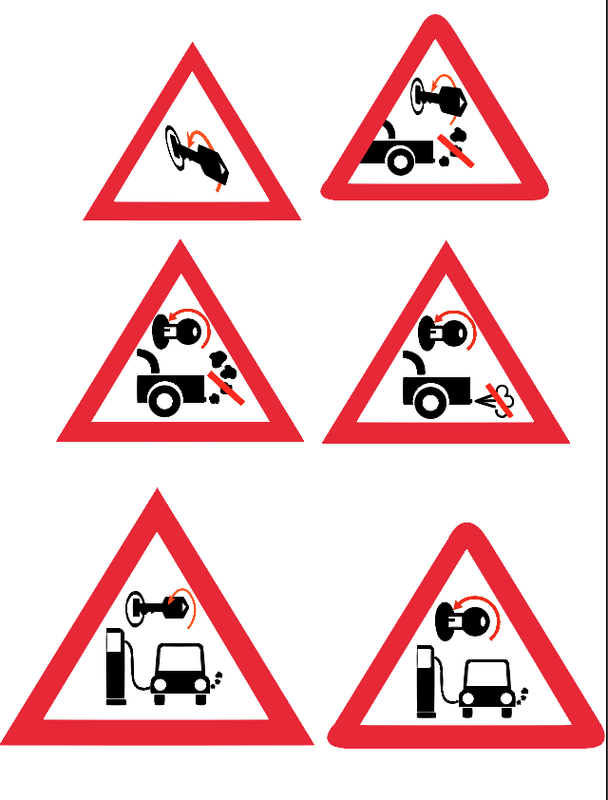 • The local sign is very dramatic and represents what might happen if the engine is not turned off. It is a clear warning and does not need to be interpreted. • My final design for this aspect had to be clear and to catch attention. This is why I used the circle and the finger on the key. 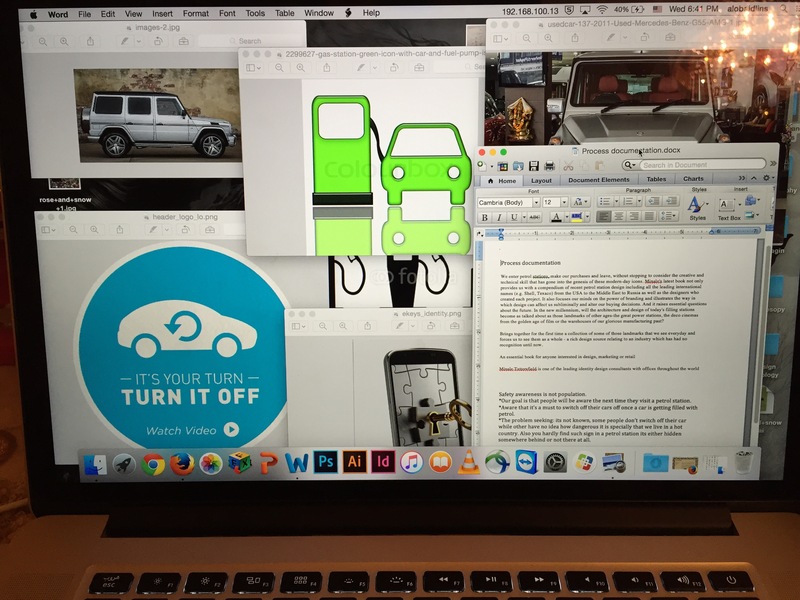 The process of designing my signs began with a look at what people do not do, even though they should do this. 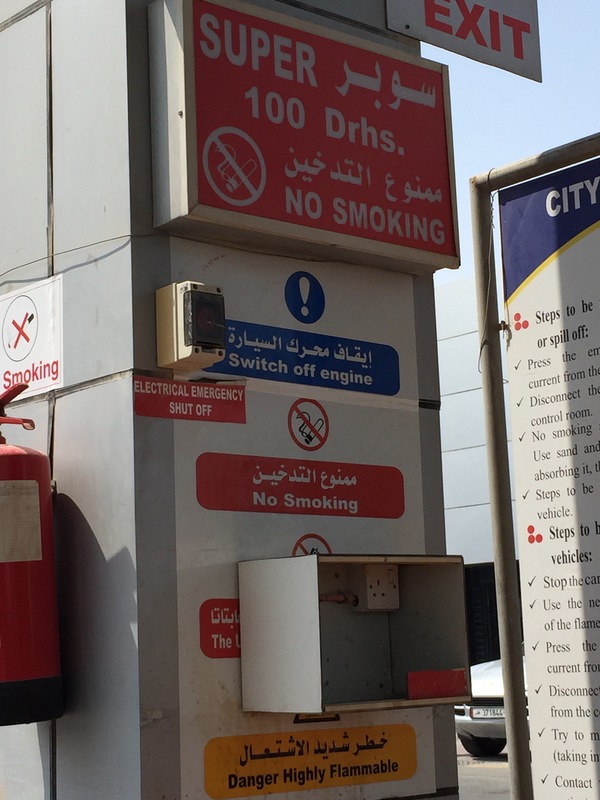 According to notices in petrol stations, people should switch off their engines when filling with petrol because of the risk of fire, but people ignore these signs because they are not visual and are in languages that many people in Qatar cannot read. This was my starting point. 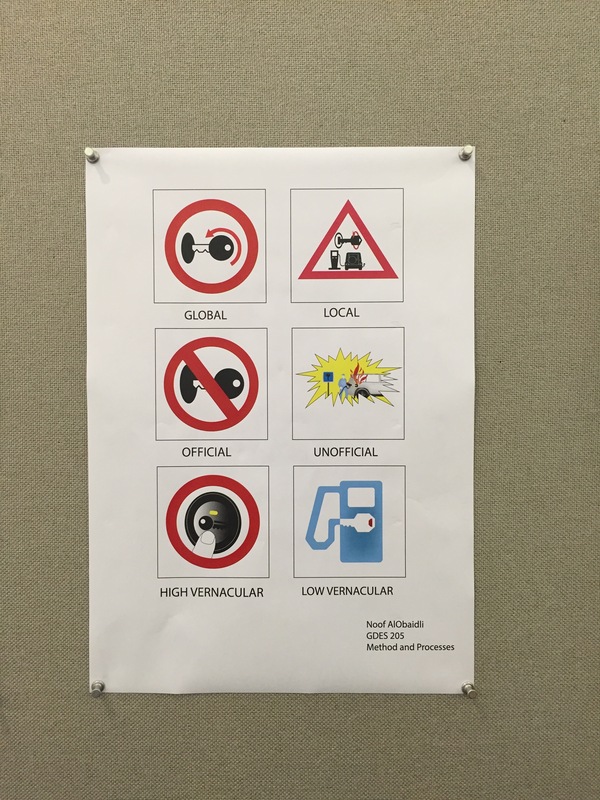 From there, I looked at how to make my signs universal and also with high impact. I decided that there could be two types of signs – one that is universal and one that is local. 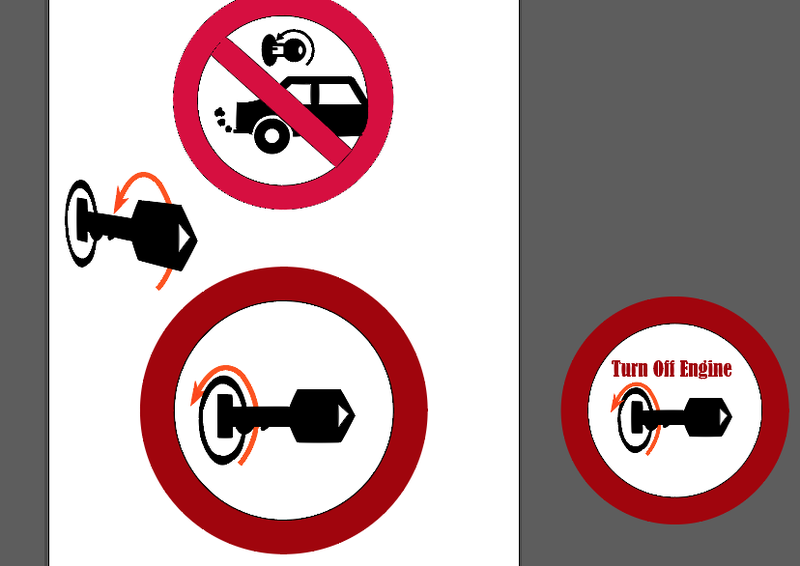 The universal signs contain the essential elements of a key and an indication that it needs to be turned off. The local sign is more explicit and also more dramatic in order to inform drivers who are not aware of the meaning of universal signs. In other words, I needed my signs to be available and accessible to the whole population of Qatar and not only to the minority. 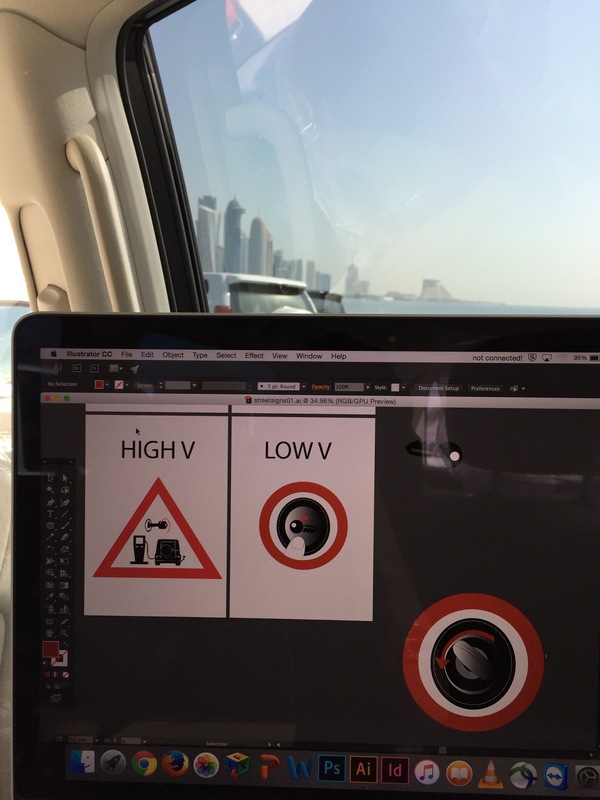 I believe that by exploring the design of my signs through a process of thoughts that lead to drafts and finally to the finished product, I was able to create signs that have both local and international significance and that can be used to help to improve safety in Qatar. 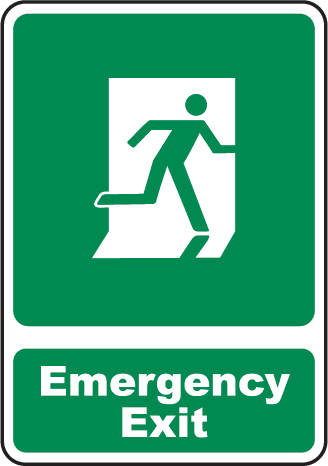 These signs have value because they inform and also carry a sense of urgency and importance, and are not easy to ignore.